Do you struggle with bloating, gas, food sensitivities, constipation, diarrhea, or heartburn? You probably know something’s wrong, but you can’t figure out what to do! Learn about our favorite stool test to treat what is really going on in your gut. Did you know hormone treatment plans can be unsuccessful due to poor testing of hormone levels? Read on to learn about our preferred, more accurate method of testing and balancing your hormone levels. Even if you eat well and exercise, you likely have glyphosate toxicity. So before you take another bite of your salad or soup, join me as I share how you can avoid further exposure and clear glyphosate toxicity from your body. Toxin binders are substances that “bind” toxins and facilitate their elimination from the body. I’ll share my favorite options for these potent detoxifiers of heavy metals, mycotoxins, and bacterial toxins. Do you suffer from hormonal imbalances? Seed cycling is a natural, cheap home remedy for hormone balance. Learn how you can customize seed cycling to fit your specific situation. Lara Adler is an environmental toxins expert who teaches practitioners very detailed information about toxins so that they can share it with their clients. In this episode we talk about how & why toxins affect our weight, ways to reduce toxins in our lives, and childhood obesity. Are you doing all the ‘right things’ but still feeling blah? 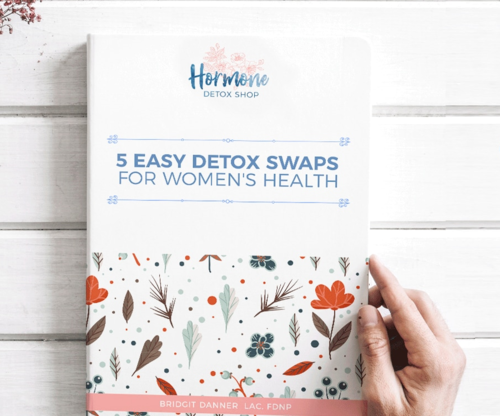 Get my list of 5 Easy Detox Swaps for Women’s Health to start clearing out the toxins and reset your system to feel better today! Robyn Openshaw is a researcher and wellness author of 15 titles, including 2017’s #1 bestseller Vibe, The Green Smoothies Diet, and 12 Steps to Whole Foods. She's our first guest this year where we talk about detox, toxins, dieting and eating healthy. 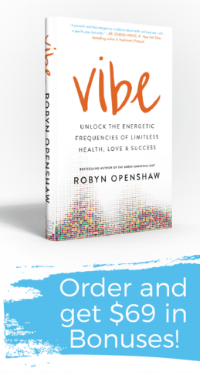 Min 02:15 Introduction to Robyn Openshaw & her new book "Vibe"
If you have not yet joined our community, be sure take our "Is a Gut Infection Causing Your Hormonal Imbalance" quiz here, and come on board! We have lots of valuable, free resources for women's health we share weekly. How many chemicals are you being exposed to on a daily basis? Probably more than you can imagine! When it comes to personal care products, it is estimated that the average woman typically uses 9-12 personal care products each day (including cosmetics). This exposes her to between 125-168 different chemicals. In addition to personal care products, there are other items you come in contact with throughout the day such as cleaning chemicals, plastics, flame retardants and more. Chemicals used in household products are taking a toll on us. For the sake of your health, it’s important to take steps to reduce the amount of chemicals you are being exposed to everyday. There are roughly 85,000 chemicals registered for use in the United States and only a small percentage of those chemicals have been thoroughly tested for safety. So what are we to do? Is it possible to ditch everyday household products filled with nasty chemicals and opt for more natural alternatives? Yes, it definitely is! When it comes to household products, the following natural ingredients provide great alternatives to costly, toxic chemical products. Vinegar is a weak acid that disinfects, sanitizes and deodorizes. Therefore it is a great natural cleaning substance. Vinegar is proven to be effective against a variety of viruses, bacteria, and mold. Vinegar has a wide array of uses and can help clean everything from your carpet and tile to your bathroom and laundry. Personally, I add vinegar to my laundry instead of using fabric softener and I keep a spray bottle of vinegar in my bathroom to help clean my shower. After showering, I spray vinegar on the walls and in the corners of my shower to help reduce the growth of mildew. Baking soda is 100 percent sodium bicarbonate and helps regulate pH. When you think of baking soda, you might think of it as an ingredient in a baked good. However, baking soda has many other beneficial uses and is a great deodorizer, neutralizer and cleanser. It also has anti-fungal properties. Baking soda can be used as a scouring agent on your kitchen counters. I use baking soda as a scouring agent on my shower floor. You can make it into a cleaning paste by adding a little water. Baking soda is also great to keep in your refrigerator as a deodorizer. In addition to the above, baking soda cuts grease so try it when you clean dishes or want to remove an oil stain from clothing. Essential oils are great to add to your cleaning recipes. Different oils offer different benefits. Tea tree oil is a popular option when it comes to cleaning since it has powerful antimicrobial properties. It also has antiseptic and anti-fungal properties. Tea tree oil is distilled from the Australian tree Melaleuca alternifolia and can help fight mildew. Use it in your laundry to help remove the smell of mildew from your clothing and use it in your cleansers to help with disinfecting surfaces. Eliminating chemicals from your household products is possible and is a huge benefit to you and your family! 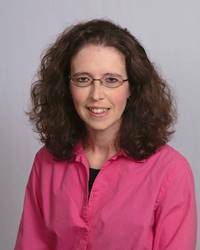 Teresa Jungling is the owner of the healthy living blog, Living Natural Today and the previous radio show host of Living Natural Today - Out with Toxins, In with Your Health. Living Natural Today is a resource for those looking to create a more natural home and live a healthier lifestyle. Download her free guide to discover ways in which you can create a healthier, more natural home for you and your family.